Imagine Dragons (Unsigned), who put on a magical show–one of the very best we’ve seen, have had a busy year releasing their second EP (Hell and Silence) and recording a yet unreleased third EP in addition to performances such as Las Vegas’ Caesar’s Palace with JET (EMI Recs)/Crash Kings (Motown Recs), Hard Rock Cafe with Neon Trees (Mercury Recs)/Paper Tongues/Civil Twilight, Neon Reverb Festival with members of Queens of the Stone Age, The Viper Room with Free Energy (DFA Recs), and the BMI Showcase at SXSW. The buzz just keeps building with this band. 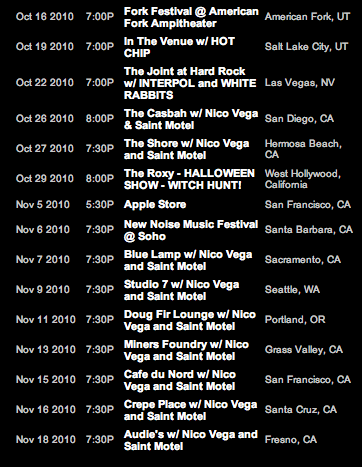 Nico Vega (Interscope/MySpace Recs) have spent 2010 on tour with Metric, Sweethead (member of Queens of the Stone Age), and Soundtrack of Our Lives already. Saint Motel (Unsigned) went on tour with Band of Skulls and recently featured on KCRW and the Sunset Strip Music Festival in 2010.